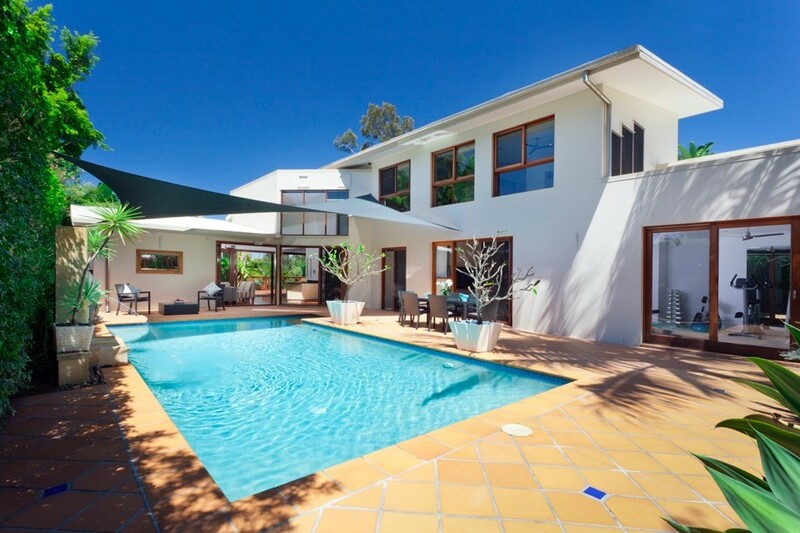 Pool surrounds are a big part of the experience of using your swimming pool. Anytime you get in or out of the pool you’ll have to cross your decking. If you have a poolside entertaining area, you’ll spend even more time on the decking, so you’ll want to make sure to pick something you love. The decking also hugely affects your pool design and surrounds overall, so choosing something that fits in aesthetically is important as well. Finally, safety and comfort should always be a consideration—is the decking slippery when wet? Does it get extremely hot in the middle of the day? Here we’ll take a look at two popular choices for pool surrounds, timber and stone, and delve into their strengths and drawbacks as a decking material around your pool. Timber is an attractive decking option that can fit into a more rustic or more modern style of home and pool. Timber decking can be especially useful if you want to extend your decking over a sloped area, as wood requires a gap between the decking and earth for air to circulate anyway. Many options are available for timber decking, but the availability and cost can vary widely depending on the wood you are looking for. Merbau and spotted gum are both great options for timber decking as they are both hardwoods that are resistant to warping and bending. As for the coping area around the pool, it is possible to use timber coping, but it’s generally recommended to use stone for coping and install the decking behind it. This is because the stain of the wood can sometimes bleed into the pool and stain its interior. Timber can be cut into wide or thin planks and can be laid in a variety of patterns to create the look you want. It does, however, need to be cleaned and re-stained every year or two to avoid splintering. It should also be noted that especially if your decking is in a shaded area, you’ll need to be aware of it growing moss overtop, which can make the wood extremely slippery. Stone also creates an attractive, natural look for your pool surrounds. Its texture makes it slip-resistant, and many different varieties of stone are available to fit in with your aesthetic. The price will, of course, depend on the type of stone and where it’s brought in from, but an extensive range of stones are available in all price ranges, so it’s easy to find something you like. Some common types of paving stones include Sandstone, Limestone, Granite, and Quartzite. Most come in a variety of shapes including squares, rectangles, triangles, and irregular shapes, which can also be combined to create fun patterns for the pool surrounds. Darker stones tend to get hot in the middle of the day, so if your pool is in direct sunlight most of the day, you may want to consider going with a lighter shade. Paving stones can be expensive but will last forever and can be easily replaced if one stone becomes damaged. You simply need to find the same type of stone in the same dimensions and pop it into the void left by the broken one. This makes maintenance essentially non-existent, which is a huge plus when you have a nice pool to take care of!